With the recent changes to Facebook Pages, brands have seen their reach drastically curtailed, and this is nothing but good news for Google. Google Plus pages are similar to Facebook Pages, and have a few functional advantages, such as direct integration with Google’s local business listings. Since the Facebook changes will have you re-evaluating the social media portion of your marketing mix anyway, a good look at Google’s options is in order. So here is a step-by-step guide to launching your brand page. Since Google integrates all its services, a Gmail.com account is the starting point for any serious endeavor. Don’t use a personal account for this. A more brand-specific account is what you want, something your entire marketing team can access, and that can weather changes in staffing without creating chaos. Local Business or Place – This is the one you use for any local business, for instance, restaurants, hotels, stores, or services. Your country and the business’ primary phone number will be required to create this variety of Page. Google will then match this data to Google Places and will use that info, if there is any, to populate your Page. Never fear, if there is no existing entry you can manually add your info. Company, Institution or Organization – Nonprofits, fan clubs, institutions, and more come under this heading. You will get a range of subcategories, just as with Brand/Product Pages. Arts, Entertainment, or Sports – This is the type of Page you would create for a book. TV, movies, music, sports, and other entertainment-oriented works fall under this heading. As usual, you will get to choose from an array of subcategories. Other – There are always projects and organizations that fall outside of the categories presented. If you want to create a Page and don’t find a good fit among the existing categories, select “Other.” This will allow you to enter your page name and website with no need for category selection. No matter what type of Page you choose to create, you must also choose your page’s content rating. Categories include: any Google Plus user; users 18 or older; users 21 or older; or a page with a specific note that the content will be alcohol-related. When you’re finished, agree to terms and conditions to continue. There are a few steps to this. Keep in mind that the more complete your Page is, the more useful it is. Add a tagline (10 words) and profile photo (the recommended image size is 1080×608, with a maximum size of 2120×1192, and a minimum size of 480 x 270). Edit your Page information. 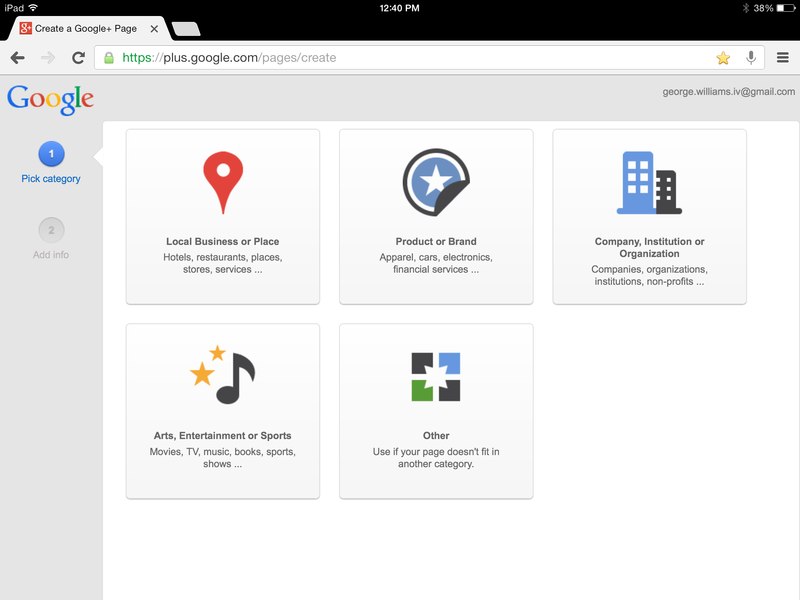 Go to your page’s profile by clicking on the Profile icon at the top, left of the Search Google+ box. Then go to your About tab and Edit Profile. This lets your set up everything from your page name to your links. Especially important things to set up here include Introduction, Hours (for local businesses or places), Website and Contact Info (phone, email, Skype, etc.). Use the Link button under Recommended Links to link to your other social profiles, blog, blog posts, and other online profiles. Google Plus allows you to target your content using Circles. Any content can be posted either publicly, to one or more Circles, or to individual users. Pages automatically start off with four default circles. Team Members – Staff, PR Team, and any consultants you might employ can be put in this Circle. This creates a great “back channel” for intra-company communications. VIPs – Your most loyal customers and closest partners. This is a Circle you can use for making special offers to your best customers. Customers – This will be your largest Circle once you’ve gotten some attention. This is where you can distribute online discounts and other customer-only data. It can also become your channel for offering product support. Following – This is the Circle for people and Pages that you want to keep up with but are not personally connected to as a brand. Next week we will take a look at the best ways to use circles and engage with your online community using your new Google Plus Page. If you have any particular questions about setting up your Page, please leave them in the comments and I’ll get back to you as quickly as possible.